Bishops debate Arianism at the First Council of Nicea. Arianism was a major theological movement in the Christian Roman Empire during the fourth and fifth centuries C.E. The conflict between Arianism and standard Trinitarian beliefs was the first major doctrinal battle in the Christian church after the legalization of Christianity by Emperor Constantine I. Named after an Alexandrian priest named Arius, Arianism spawned a great controversy that divided the Roman Empire and defined the limits of Christian orthodoxy for centuries to come. The controversy involved not only emperors, priests, and bishops, but also simple believers throughout the Christian empire. Bitter disputes among popular church leaders led to mob violence and political turmoil, and thus Emperor Constantine was moved to convene the First Ecumenical Council at Nicea in 325. The Nicene Creed rejected the tenets of Arianism and exiled its main proponents, but did not put an end to the controversy. Constantine eventually reversed his position, pardoned Arius, and sent his main opponent, Athanasius of Alexandria, into exile. Later fourth century emperors supported Arianism, but in the end, the Athanasian view prevailed and has since been the virtually uncontested doctrine in all major branches of Christianity. Arius taught that although God the Son indeed pre-existed as a divine being before the creation of the Universe, he was not "co-eternal" with God the Father. The opposite position, championed by Athanasius, held that the Father and Son existed together with the Holy Spirit from the beginning. Further disagreements involved the question of whether the Son and the Father were of the "same substance" and whether the Son was in any way subservient to the Father. Arianism was the first form of Christianity to make major inroads with the Germanic tribes, and many of the "barbarians" who conquered Rome were actually Arian Christians. As a result of Arianism being successfully taught to the Germanic tribes by the missionary Ulfilas, Arian Christianity lingered for several centuries in western Europe after the fall of the western Roman Empire. Strict Arians condemned the term homoousios, but also rejected "homoiousios" as conceding too much, insisting instead on the term "anomoios." "One true God… alone unbegotten, without beginning, without end, eternal, exalted, sublime, excellent, most high creator, epitome of all excellence... who, being alone… did create and beget, make and establish, an only-begotten God [Christ]. Author of all things [made to exist] by the Father, after the Father, for the Father, and for the glory of the Father... He was both great God and great Lord and great King, and great Mystery, great Light and High Priest, the providing and law-giving Lord, Redeemer, Savior, Shepherd, born before all time, Creator of all creation. In his preaching and exposition he asserted that all heretics were not Christians, but Antichrists; not pious, but impious; not religious, but irreligious; not timid but bold; not in hope but without hope; not worshipers of God, but without God, not teachers, but seducers; not preachers, but liars; be they Manichaeans, Marcinonists, Montanists, Paulinians, Psabbelians, Antropians, Patripassians, Photinans, Novatians, Donatians, Homoousians, (or) Homoiousians. I believe that there is only one God the Father, alone unbegotten and invisible, and in His only-begotten Son, our Lord and God, creator and maker of all things, not having any like unto Him… And I believe in one Holy Spirit, an enlightening and sanctifying power...[who is] neither God nor Lord, but the faithful minister of Christ; not equal, but subject and obedient in all things to the Son. And I believe the Son to be subject and obedient in all things to God the Father." Arius reportedly learned his doctrine from an Antiochan presbyter (priest/elder) and later martyr named Lucius. Arius spread these ideas in Alexandria and was appointed a deacon in that city by its bishop, Peter. Controversy ensued, and Arius was briefly excommunicated, but was soon reconciled with Peter's successor, Achillas, who promoted him to the position of presbyter, providing him authority as a teacher of church doctrine. A persuasive orator and gifted poet, Arius' influence grew steadily. However, he gained the enmity of another new bishop, Alexander, and in 321 Arius was denounced by the local synod for teaching a heterodox view of the relationship of God the Son to God the Father. Despite this setback, Arius and his followers already had great influence in the schools of Alexandria, and when he was forced into exile, his views spread to Palestine, Syria, and other parts of the eastern Mediterranean. His theological songs and poems, published in his book, Thalia, were widely recited. Many bishops soon accepted Arius' ideas, including the influential Eusebius of Nicomedia, who had the ear no less a personage than the Emperor himself. Icon depicting Emperor Constantine and anti-Arianist bishops with the Nicene creed. Constantine's hopes that Christianity would serve as a unifying force in the empire, meanwhile, faced frustration. By 325, the Arian controversy had become significant enough that he called an assembly of bishops, the First Council of Nicea. Reports vary, but the church historian Eusebius of Caesaria indicated that the Emperor himself expressed his support of the term homoousios to the council. Arius' views may have been losing the day in any case, but once the Emperor weighed in, the Arian cause was hopeless. The council condemned Arianism and formulated the Nicene creed, which is still recited in Catholic, Orthodox, Anglican, and some Protestant services. begotten, not made, being of one substance (homoousios) with the Father. But those who say: "There was a time when he was not"; and "He was not before he was made"; and "He was made out of nothing"; or "He is of another substance" or "essence"... they are condemned by the holy Catholic and apostolic Church. Constantine exiled those who refused to accept the creed—including Arius himself and several others. He also exiled the bishops who signed the creed but refused to condemn Arius—notably Eusebius of Nicomedia and Theognis of Nicea. The Emperor also ordered all copies of the Thalia, the book in which Arius had expressed his teachings, to be burned. This ended the open theological debate for several years, but under the surface, opposition to the Nicean creed remained strong. Eventually Constantine became convinced that homoousios was an ill-advised and divisive term. It the previous century, it had been condemned by several church councils because of its association with the teaching of the heretic Paul of Samosata. Otherwise orthodox bishops, espeically in the East, adamantly rejected the term. Concerned to bring peace to the Empire, Constantine became more lenient toward those exiled at the council. He allowed Theognis of Nicea and Eusebius of Nicomedia, a protégé of his sister, to return once they had signed an ambiguous statement of faith. The two, together with other friends of Arius, then began to work for Arius' rehabilitation. At the synod of Tyre in 335, they brought accusations against Arius' nemesis, Athanasius, now the powerful bishop of Alexandria. Constantine had Athanasius banished, considering him intransigent and an impediment to reconciliation. In the same year, the synod of Jerusalem readmitted Arius to communion, and in 336, Constantine allowed Arius to return to his hometown. Arius, however, soon died. Eusebius and Theognis remained in the Emperor's favor. When Constantine, who had been an unbaptized believer much of his adult life, accepted baptism on his deathbed, it was from the semi-Arian bishop Eusebius of Nicomedia. Proponents of Arianism and semi-Arianism prospered under the 24-year reign of Constantius II, shown above. After a struggle during the reign of Julilan the Apostate, they regained a favored position under Valens. The Nicean terminology was proving insufficient. After Constantine's death in 337, open dispute resumed again. Eusebius of Nicomedia, who had been made bishop of Constantinople, became an adviser to Constantine's son Constantius II, then emperor of the Eastern half of the Empire. Constantius encouraged the anti-Nicene groups and set out to revise the official creed itself through numerous Church councils. He proceeded to exile bishops adhering to the old creed, including Athanasius, who fled to Rome. In 355 Constantius became the sole Emperor and extended his pro-Arian policy to the western provinces. When the Bishop of Rome, Liberius, refused to sign a denunciation of Athanasius, Constantius forced him into exile for a period of two years, the first instance a long struggle in which the Roman church would emerge—in its view—as the champion of orthodoxy in the face of royal error. As debates raged in an attempt to come up with a new formula, three camps evolved among the opponents of the Nicene Creed. The first group opposed the Nicene formula mainly because of the divisive term homoousios, which some had rejected as heretical long before the advent of the Arian controversy. They preferred the term homoiousios. They rejected Arius, and accepted the equality and co-eternality of the Three Persons of the Trinity. However, they were usually called "semi-Arians" by their opponents. The second group—called both Arians and semi-Arians—in large part followed Arius' teachings but avoided invoking his name. In another compromise wording, they described the Son as being "like" the Father (homoios). A third, overtly Arian, group described the Son as unlike (anomoios) the Father and condemned the compromisers as heretics. Some bishops, of course, did not fall neatly into any of the above categories. Meanwhile, some among the now persecuted Nicene group stubbornly rejected any formula but the original one, which they deemed to be inspired by the Holy Spirit. Coalitions between semi-Arian and moderate Nicene bishops waxed and waned, while other semi-Arians found allies among their more strict Arianist brethren. Whereas the term 'essence,' (ousia) has been adopted (by) the Fathers in simplicity, and gives offence as being misconceived by the people, and is not contained in the Scriptures, it has seemed good to remove it, that it be never in any case used of God again, because the divine Scriptures nowhere use it of Father and Son. But we say that the Son is like (homoios) the Father in all things, as also the Holy Scriptures say and teach. Saint Jerome remarked that the world "awoke with a groan to find itself Arian." After Constantius' death in 361, Bishop Liberius of Rome declared the above-mentioned councils null and void. Meanwhile, Constantius' successor Julian the Apostate, a devotee of paganism, declared that the empire would no longer favor one church faction over another. He allowed all exiled bishops to return. With no political consequences at stake for expressing previously unacceptable views, the Nicene formula re-emerged as a rallying point for many bishops, particularly in the West. The next emperor, Valens, however, revived Constantius' policy and supported the "Homoian" party, exiling opposing bishops and often using force. Many Nicene bishops were exiled to the other ends of the Empire. These contacts, paradoxically, contributed to a rapprochement between the Western supporters of the Nicene creed and the Eastern semi-Arians. The tide turned decisively against Arianism when Valens died in battle in 378 and was succeeded by Theodosius I, who strongly adhered to the Nicene Creed. Two days after Theodosius arrived in Constantinople, on November 24, 380, he expelled the Homoian bishop, Demophilus of Constantinople, and gave the supervision of the churches of that city to the future Bishop Gregory of Nazianzus, the leader of the rather small Nicene community there, an act which provoked rioting. Theodosius had recently been baptized during a severe illness, as was common in the early Christian world. In February he published an edict ordering that all Roman subjects should profess the faith of the bishops of Rome and Alexandria (i.e., the Nicene faith). 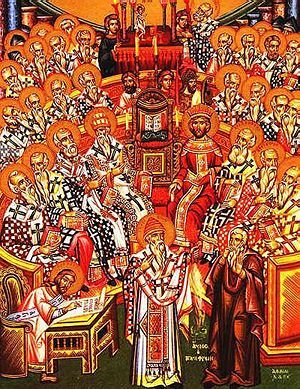 In 381, at the Second Ecumenical Council in Constantinople, a group of mainly Eastern bishops assembled and accepted the Nicene Creed. This is generally considered the end of Arianism among the non-Germanic peoples. At the close of this council, Theodosius issued an imperial decree ordering that any non-conforming churches would be turned over pro-Nicene bishops. Although many in the church hierarchy in the East had opposed the Nicene creed in the decades leading up to Theodosius' accession, he managed to impose unity by a combination of force and effective administration. During the time of Arianism's flowering in Constantinople, the Goth convert Ulfilas was sent as a missionary to the Gothic barbarians across the Danube, a mission supported for political reasons by Constantius II. Ulfilas' initial success in converting this Germanic people to an Arian form of Christianity was strengthened by the fact that Arianism was favored by the contemporary emperors. 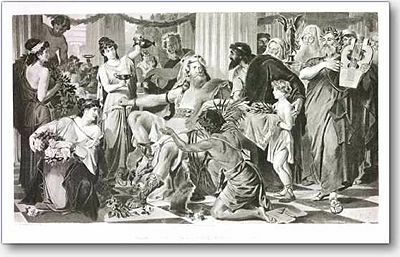 Alaric I, who conquered Rome in 410 B.C.E.., was an Arian Christian. When the Germanic peoples entered the Roman Empire and founded successor-kingdoms in its western part, most had been Arian Christians for more than a century. The conquerors established Arian churches throughout much of the former western Roman empire. Parallel hierarchies served different sets of believers—the Germanic elites being Arians, while the majority population adhered to the Nicene creed. While most Germanic tribes were tolerant regarding the trinitarian beliefs of their subjects, the Vandals tried for several decades to force their Arian belief on their North African trinitarian subjects, exiling trinitarian clergy, dissolving monasteries, and exercising heavy pressure on non-conforming Christians. Other Germanic Arian tribes tended to be less adamant in their faith than Nicene Christians, and the orthodox party possessed advantages in literacy and the sophistication of their Christian culture. By the beginning of the 8th century, the Arian kingdoms had either been conquered (Ostrogoths, Vandals, Burgundians) by Nicene neighbors, or their rulers had accepted Nicene Christianity voluntarily (Visigoths, Lombards). The Franks were unique among the Germanic peoples in that they entered the empire as pagans and converted to Nicene Christianity directly. As the first major intra-Christian conflict after Christianity's legalization, the struggle between Nicenes and Arians left a deep impression on the institutional memory of Nicene churches. Thus, over the past 1,500 years, some Christians have used the term Arian to refer to those groups that see themselves as worshiping Jesus Christ or respecting his teachings, but who place Jesus in a subservient position to God. In 1553, the Spanish scholar and Protestant reformer Michael Servetus, seen by many Unitarians as a founding figure, was sentenced to death and burned at the stake by his fellow reformers, including John Calvin, for the heresy of Antitrinitarianism. His Christology was similar in several ways to Arianism. Like the Arians, many more recent groups have embraced the belief that the Son is a separate being subordinate to the Father, and that Christ at one time did not exist. Some of these profess, as the Arians did, that God made all things through the pre-existent Christ. Others profess that Jesus became divine through his obedience to God. Despite the frequency with which Arianism is used to describe such groups, there has been no historically continuous survival of Arianism into the modern era, nor do the groups so labeled hold beliefs identical to Arianism. For this reason, they do not use the name as a self-description, even when they acknowledge that their beliefs are occasionally in agreement with Arianism. Unitarians, who believe that God is one, as opposed to a Trinity, and who often accept Jesus as a moral authority but not as a divinity. Jehovah's Witnesses, who—like Arius—teach that Jesus had a pre-human existence as the Logos, but not as the Second Person of the Trinity in the orthodox sense. Christadelphians, who believe that Jesus' pre-natal existence was as a conceptual Logos, rather than an actual Son to God the Father. Followers of the various churches of the Latter-day Saints, who believe in the unity in purpose of the Godhead but teach that Jesus is a divine being distinct from the Trinity. Unificationists, who believe that Jesus was the incarnation of the pre-existent Logos, but who also affirm that God existed alone before conceiving his Ideal of Creation. Muslims, who believe that Jesus was a prophet of the one God, but not himself divine. Gregg, R. C., ed., Arianism: Historical and Theological Reassessments. 1987. Gwatkin, H. M., Studies of Arianism, 2d ed. 1900. William Barry Arianism Catholic Encyclopedia 1907 ed. This page was last modified on 13 April 2016, at 14:39.